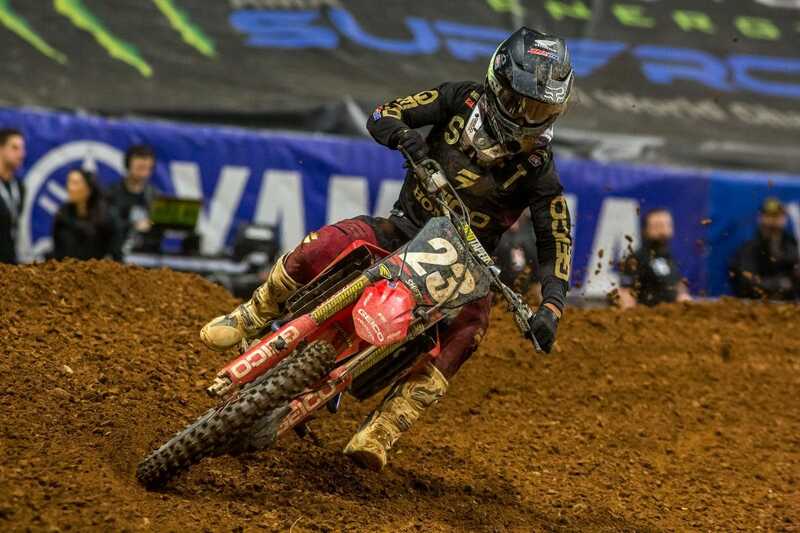 The 250 Eastern Regional Supercross Championship is back in action in Nashville, Tennessee after a brief break in the action. 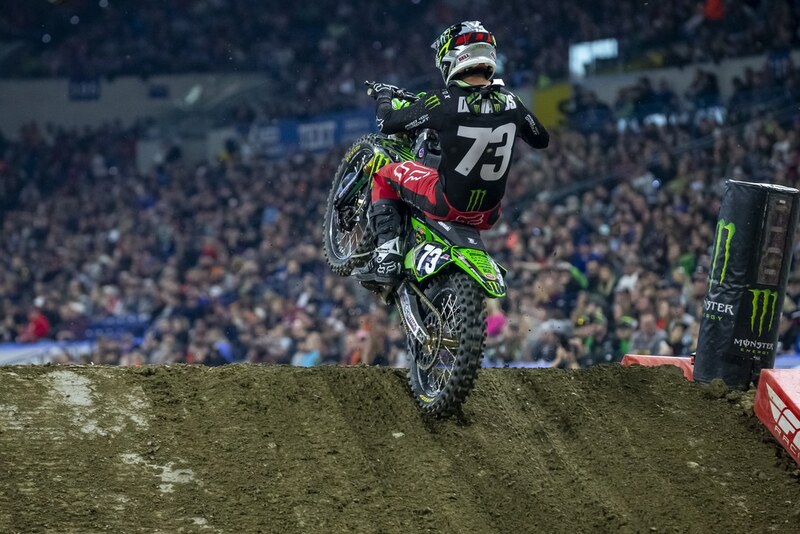 Pro Circuit Kawasaki’s Austin Forkner had dominated the series so far. He had won five out of six main events so far. Even in Atlanta–the one where he was third–he was still the top eastern rider. Now, however, everything might change. 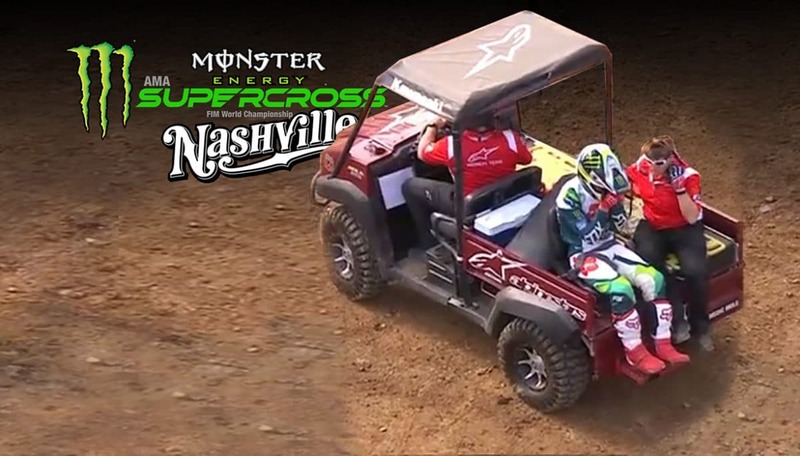 A practice crash at Nashville put Forkner’s whole season in jeopardy. He had a 26-point lead, which is one full race, and there are two rounds after this. For the Nashville 250 Main Event results, click here. Austin Forkner’s weekend took a turn for the worse in practice. He crashed toward the end of the first qualifying session after setting the fastest time. When he went out for session two, it was clear that something wasn’t right. At one point he over jumped and landed hard, then immediately pulled off. His night now looks highly questionable. That left Chase Sexton with the fastest time over Forkner’s teammate Martin Davalos. The track conditions were much better in the second session, with most of the best times coming late. Austin Forkner left no question about his intentions in 250 Group A, session 1. He was the fastest man–not by just a little, either. He was a full second over Mitchell Oldenburg. It isn’t unusual to see 10 riders within a second. He crashed twice, however, and the second one looked hard. Ryan Sipes is back in action, and he set the bar early in 250 group B, session one. Ryan turned a 52.131, but spun out afterward. The soil is already looking dry and a little dusty. Fredrik Noren is also back and healthy. He rode well in that first practice, as well, but was edged out in the number two spot by Isaac Teasdale. The fact that this is the first Supercross held here attracted more 250 riders than we’ve seen in recent races. That prompted a C group, which was topped by Tanner Stack with a 55.129.